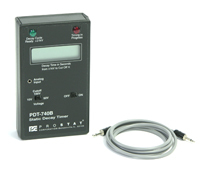 Used in conjunction with the PFM-711A Field Meter. Designed to measure the time required for a 1,000 volt charge to dissipate to less than 100, 50 or 10 volts in tenths of a second. Used to evaluate the static decay capabilities of materials, personnel, equipment and other products. Compatible with most portable CPM's and field meters having an analog output of ± 2 (10,000 volts equals 1 volt).